A high wind warning is now in effect for the desert areas east of San Diego with the possibility of wind gusts of up to 90 mph. The warning will be in effect from noon Monday to 3 a.m. Tuesday according to the National Weather Service. Winds will strengthen through the day Monday reaching between 30 to 40 mph with gusts to 55 mph. The strongest gusts may arrive in the evening. 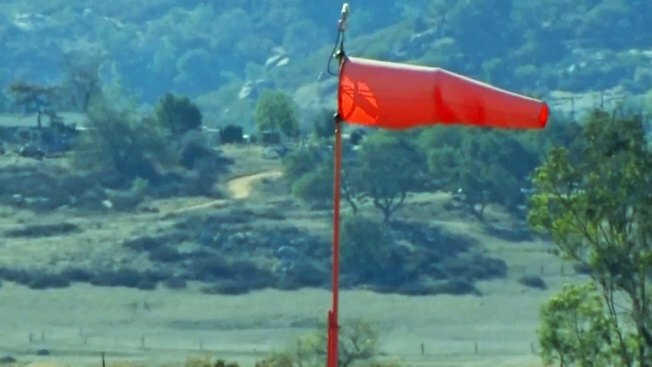 The Volcan Mountains south of Lake Henshaw saw gusts of 73 mph earlier Monday and Carlsbad and Encinitas saw 35 and 34 mph gusts. Driving may be difficult for high-profile vehicles. Broken tree limbs and other debris may be found on the roads, forecasters said. In the desert, there may be blowing sand and dust. Cloud cover is predominantly west of the mountains and the light drizzle that is coming down is barely registering on radar. There's a strong jet stream, but it's a fairly dry system with little rain expected. There's a 20 to 30% chance of light to moderate showers west on the mountains Monday evening. Isolated heavy showers are a possibility. Cooler temperatures and winds should last for the next three to four days. Download the free NBC 7 San Diego mobile app to stay updated on weather conditions in your area. Click here for SDG&E's power outage map.